Billing your clients is as important as providing services to your clients. Efficient billing ensures that you receive your account receivables timely and accurately. Currently, most organizations as well as freelancers prefer online invoicing software which is more reliable and faster than paper based billing system. AccountSight offers one of the most user friendly and simplest online time and billing software in the market. Using AccountSight, project managers can flawlessly generate invoices for clients based on dedicated billable hours and project expenses for a particular client. Also, they can create manual invoices for unscheduled irregular costs. Apart from these, AccountSight also offers the functionality of creating recurring invoices. Recurring invoices are generated in order to register the expenses incurred to purchase some specific items for a client at regular intervals, like weekly or monthly basis. Once recurring invoice is generated, it can be delivered to client cyclically as per selected criteria. A major difference between recurring invoice and invoice based on project time and expenses is that recurring invoices are created at client level whereas project based invoices are created at project level. Therefore, only administrator can create and send recurring invoices to clients. Generate recurring invoices for any client. Save default values for tax levels, discount and currency or manually set values while creating recurring invoice. Set recurring invoice frequency as weekly, monthly, quarterly, annual or custom basis as per context. Choose expense items from a pre-configured list. 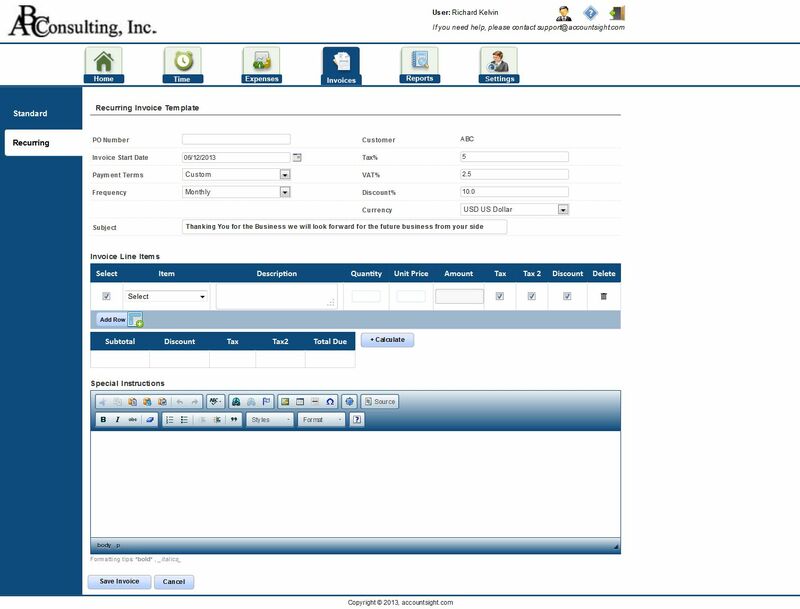 Copy existing recurring invoices, make changes and deliver to client. AccountSight’s intuitive and user friendly interface makes sure that users can manage and keep track of all recurring invoices without any hassle. Do you want to implement the recurring invoice functionality for your business? Try AccountSight! Signup to AccountSight for the 30 days FREE trial and start using it instantly!